Nearly 400,000 people use Penn Station every day, twice as many as used it when it was built. In 1993, the late Senator Daniel Patrick Moynihan proposed the conversion of the Farley Post Office building into a new Penn Station. Despite longstanding support from nearly every stakeholder, the project is only now ready to break ground 20 years later. What was behind the delays? Why are delays inherent to so many major public development projects? Are there lessons to be learned here for future planning? What are the prospects for the transformation of Manhattan’s far west side? These questions will be addressed in the Port Authority Lecture Series, presented by Milano The New School for Management and Urban Policy, the graduate program in International Affairs, and The Center for New York City Affairs on Wednesday, November 17, from 6:00 to 8:00 p.m., in the Theresa Lang Community and Student Center, 55 West 13th Street, 2nd floor. Admission is free, but reservations are required by emailing centernyc@newschool.edu or calling 212.229.5418. 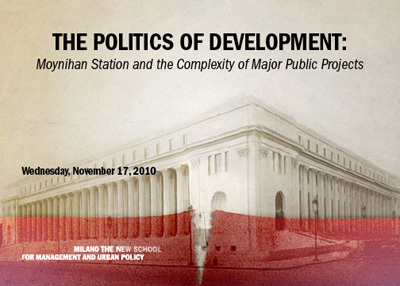 This event features remarks by Timothy Gilchrist, president, Moynihan Station Development Corporation and Christopher O. Ward, executive director, Port Authority of New York and New Jersey. Remarks are followed by a discussion moderated by Greg David, director, Business Reporting Program, CUNY Graduate School of Journalism, and featuring Vishaan Chakrabarti, director, Real Estate Development Program, Graduate School of Architecture, Planning, and Preservation at Columbia University; Anna Hayes Levin, commissioner, New York City Planning Commission and former member, Manhattan Community Board No. 4; Juliette Michaelson, senior planner, Regional Plan Association; and Tokumbo Shobowale, chief of staff, Office of NYC Mayor for Economic Development. This event is generously supported by the Port Authority of New York and New Jersey. Additional support is provided by the Milano Foundation and the Sirus Fund.